The fourth edition of the much valued European Handball Manager course will start in September. The programme will be in English this time. Handball managers, coaches and former players who want to be among the 20 participants, have only limited time left to express their interest in the course: the deadline for applications is Monday, 30 April 2018. 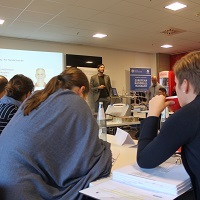 Three years ago, the EHF in cooperation with the German Sports University Cologne set up the programme, aimed at people responsible for clubs’ and federations’ business side of things in national and international handball. The number of participants has been limited to 20. Participants will have to be present at the German Sports University Cologne and Berlin for 16 days in total, followed by a second attendance phase in Berlin in January 2019 at the Men’s World Championship. The course consists of five modules: basics in economics and law, strategic handball management, marketing and sponsorship, finances and licensing as well as media and communications, and finishes with and oral and a written exam. The course targets former professional players and coaches and also managers, who have been working in professional handball for at least two years. University graduates with an expressed interest in the course are also eligible to apply. The enrolment fee is €5,000. For more information on admission, exams, attendance phases, and for a registration form visit the course’s website and see the flyer.